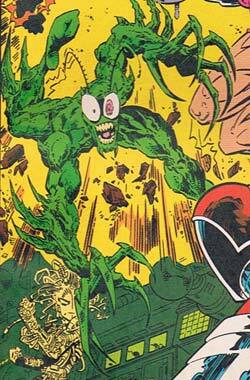 Then is this Ambush Bug on drugs? Maybe Ambush Bug after not getting a good night's sleep? Too much Ambien? Actually that's "Bedbug", a throwaway villain from the Topps version of "Jack Kirby's Silver Star". He's bursting through the wall there with "Slammazon", Gasbag, and a couple of other equally insane characters. And yes, it's ever bit as awesome as it sounds. Sometimes it's not a knockoff, it's an archetype. And as I learned from Joseph Campbell, archetypes is cool.